You can also see the average score for each question. 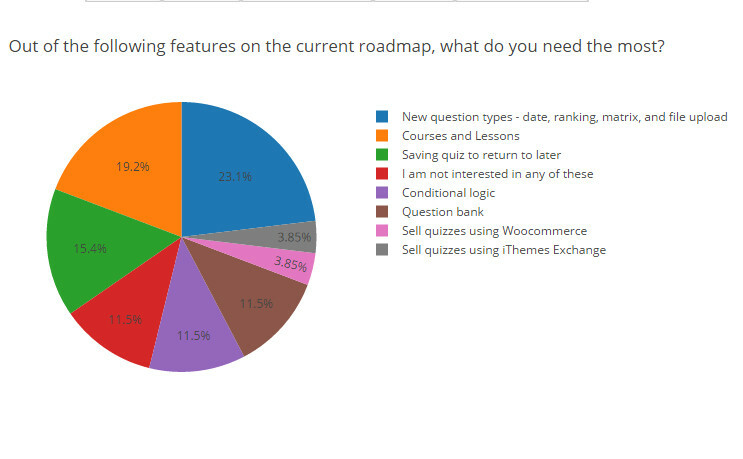 For example, you can quickly glance down the analysis and see which questions most users got wrong or answered poorly. You can use the “Individual” feature to see all answers provided to open answer questions for each question. You can then export the graphs to an image file. Print the graphs off, use them in a presentation, or use them in a document. This addon will also allow you to filter the results. You can select to only analyze the results from a certain date range. This is helpful if you want to see how answers have changed over time. You can also filter by business if you want to see how the results are for people within a certain business. You can also filter by user id and name. Even better, you can filter by multiple items. For example, you can filter by date range and business to see how different businesses have progressed over time. Lastly, this addon also allows you to export the data to a CSV file which can be imported into a variety of spreadsheet software including Excel and Google Sheets. The export can be used with the filtering to only export data from within a certain date range or by a certain user, a certain name, or a business.